Be the envy of your D&D group! 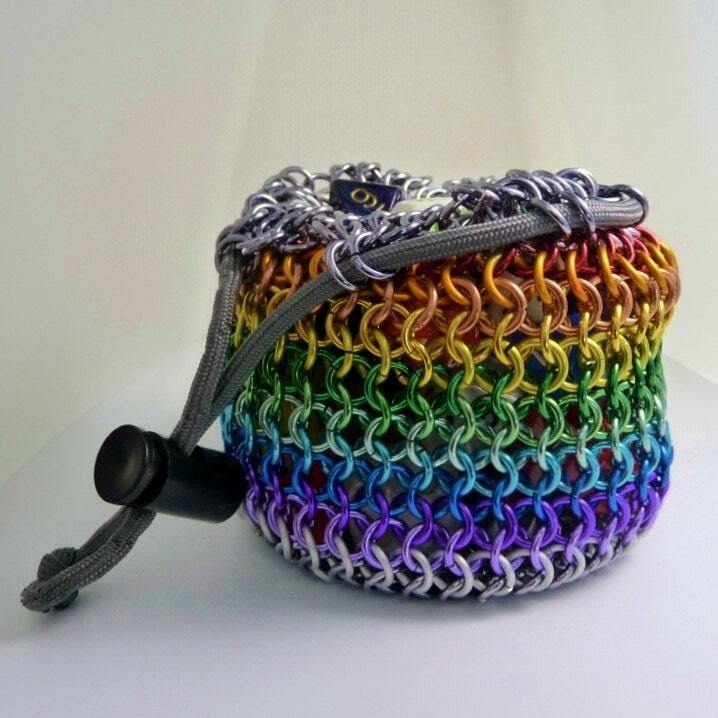 This handwoven chainmaille dice bag can be yours in your choice of colors and pattern (see picture 5 for all 25 available colors). Each bag will securely hold around 50 standard sized die. The bag is roughly 4" tall and 4" in diameter. If you need a larger or smaller bag, please email us and we'll be happy to make a custom bag and custom listing with a price adjustment. You can see the color options in picture #5 - there is no limit to the number of colors you can use. Please make sure to add a Note when placing your orders with your color/pattern requests. I will send you a sample picture of the piece in progress to make sure it is living up to your vision. The bag cinches shut with a paracord drawstring in coordinating color.